Four friends try to forget their worries by performing in a Wedding Band. Will this show have the same effect on viewers and keep them tuning in week after week or will it be cancelled instead? We’ll have to wait and see. 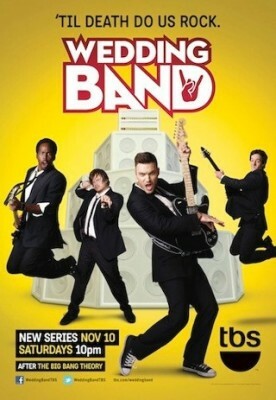 The first season of Wedding Band typically airs Saturday nights on TBS and there are 10 installments. The cast includes Brian Austin Green, Derek Miller, Harold Perrineau, Jenny Wad, Kathryn Fiore, Melora Hardin, and Peter Cambor. UPDATE: TBS has cancelled the show after one season. Final season averages: 0.5 rating in the 18-49 demographic with 1.21 million total viewers. 0.5 demo rating (+25% change) with 1.12 million (+10% change). Season averages: 0.54 in the demo with 1.21 million. 0.4 demo rating (-20% change) with 1.02 million (+9% change). Season averages: 0.54 in the demo with 1.22 million. 0.5 demo rating (-17% change) with 0.94 million (-28% change). Season averages: 0.56 in the demo with 1.24 million. 0.6 demo rating (+20% change) with 1.29 million (+25% change). Season averages: 0.57 in the demo with 1.29 million. 0.5 demo rating (+25% change) with 1.04 million (-3% change). Season averages: 0.56 in the demo with 1.29 million. 0.4 demo rating (-43% change) with 1.07 million (-25% change). Season averages: 0.57 in the demo with 1.34 million. 0.7 demo rating (+49% change) with 1.42 million (+27% change). Season averages: 0.62 in the demo with 1.41 million. 0.5 demo rating (-6% change) with 1.12 million (-10% change). Season averages: 0.59 in the demo with 1.40 million. 0.5 demo rating (-38% change) with 1.24 million (-33% change). Season averages: 0.65 in the demo with 1.54 million. 0.8 rating in the 18-49 demographic with 1.85 million total viewers. Season averages: 0.80 in the demo with 1.85 million. What do you think? Do you like the Wedding Band TV series? Do you think that it should be cancelled or renewed for a second season? Love “The Wedding Band”. Really hoping for a second season. Very funny and well written.